I recently made the Autoclaved Onion Soup on p. 3•302. No crazy ingredients in this one, just a slightly unusual approach: the ingredients are packed, raw, into mason jars, then autoclaved for 20 minutes. So there is no mention by you or in the book about putting water in the pressure cooker or using a rack. Did you put the jars in the pressure cooker dry and without a rack? No; I followed the instructions that came with the pressure cooker, and put the jars on a rack and added a cup or so of water underneath. I'm still getting the hang of pressure-cooking, but I'm under the impression that, without some form of liquid in the cooker, there wouldn't be anything to pressurize it! WHEW - I thought I was losing it. That was the procedure I thought should be followed but no one seems to have noted the added water anywhere so I was questioning my own common sense. Thanks. Interesting. I haven't tried it, but my gut feeling was that putting the food that close to the broiler would end up burning things - pretty much your experience. I was curious about the broiler rule of thumb when I read it too. The thing that I couldn’t understand was how the distance from the heating rods to the top of the oven was not a variable. I modeled the system myself and found that under my assumptions* this distance mattered. I also couldn’t come up with a good explanation for the 44% of spacing plus 5mm rule. Here is what I found. If the top of the oven is really far from the rods, or is non-reflective, then things look like you might initially guess. I plotted the relative amount of infrared delivered across the food, from left to right across the oven, assuming the oven has four heating rods spaced 10cm on centers that run front to back within the oven. There is one curve for each of several distances between the rods and the food. The top one is for a distance of 1cm from the rods to the food and the bottom one is for a distance of 10cm from the rods to the food. The ones in between are for distances as indicated in the legend at the right. 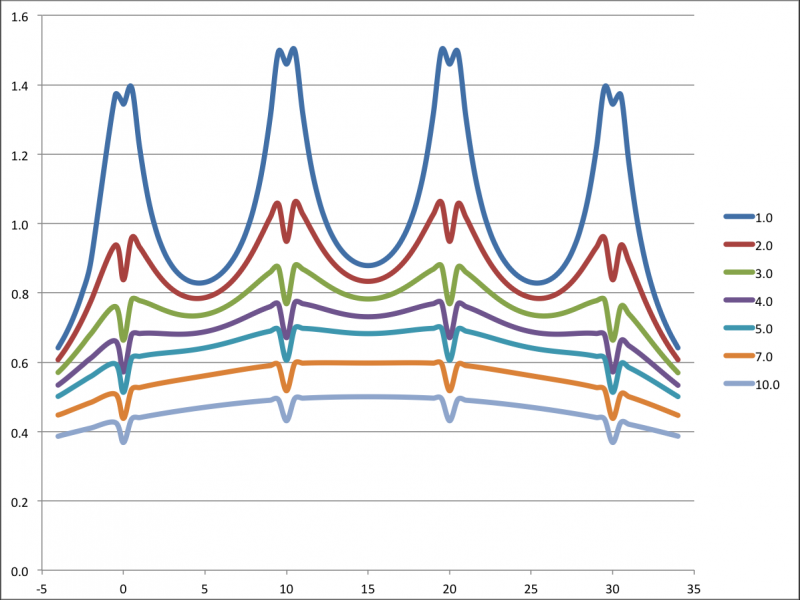 As you can see in the following graph, the heat is most intense directly under the four rods. 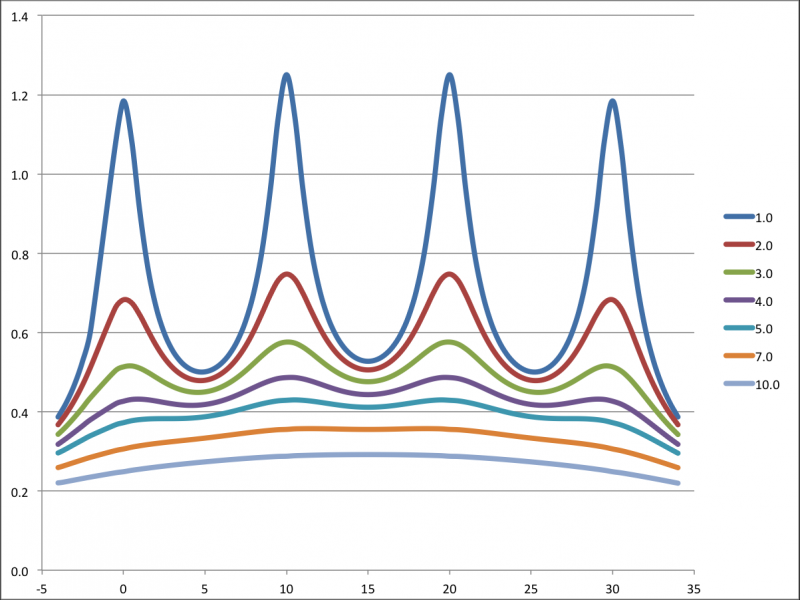 You can see from the graph exactly where the rods are. Now if we account for reflection from the top of the oven, things change a bit. Now we get more infrared hitting the food in between the rods but less directly below them due the shading effect MC describes. This is shown in the following graph, which models a reflective oven top 3cm above the rods. So what does all this tell us about the so-called sweet spot? First of all, as MC tells us, we can’t put the food too close or we get big spikes that will burn the food before it cooks in other areas. The top few curves clearly demonstrate this. 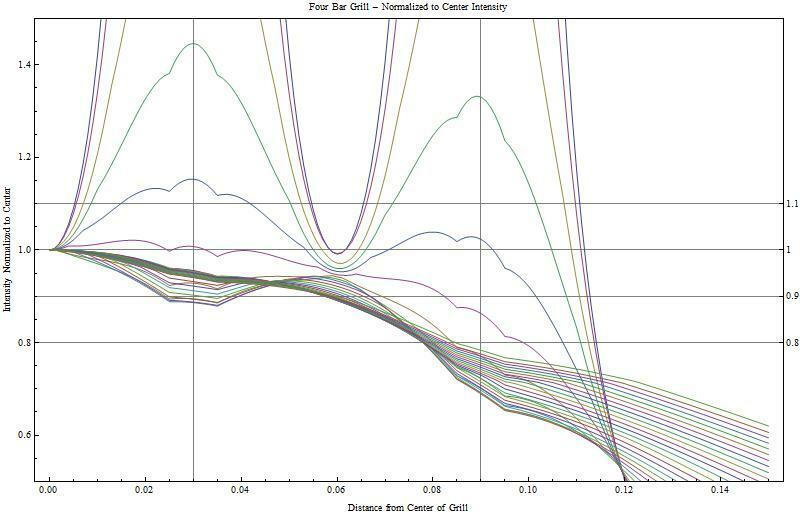 But even these curves show shade effects directly below the rods. There are also second-order shade effects where the reflected heat from one rod is shaded by an adjacent rod, but they are smaller and I did not model them. Further from the rods, the curves are smoother and flatter, but still have the shade effects on the order of 15%. The good news is they are quite narrow, so you can cut the effects in half simply by sliding your food to the left or right a couple of centimeters halfway through the cooking. Do this three or four times during the cooking, always in the same direction, and the shade effect should be effectively eliminated. I'd love to hear how the MC rule of thumb was derived and what assumptions were made. Also happy to hear feedback on my results. *My assumptions are that the heating rods are long enough and the food is sufficiently far from the end that their infrared radiation can be modeled by a 1/r rule and that the top of the oven is completely reflective in the infrared part of the spectrum. I'm going to make the mac & cheese tonight when I get home (to serve with some pulled pork sandwiches and a few other things), so I thought I'd share a tweaked version of the ratios in the book. We found that it was a bit too salty, and I wanted a stronger cheddar component. I also tweaked the techniques a bit. 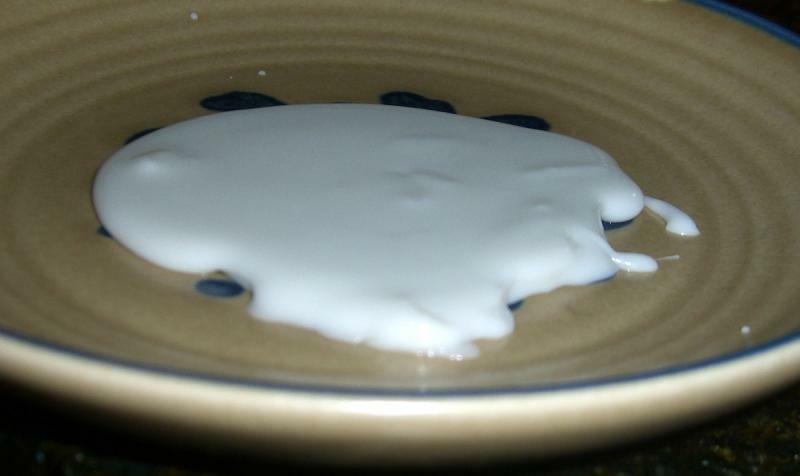 Stir until melted/emulsified. Pour into container; bring to room temp; freeze. Just before serving, pull it from the freezer and grate/shred 160g. Don't drain it. When pasta is al dente, add cheese and heat through until smooth and combined. I then put it in a Le Creuset au gratin pan, topped it with seasoned breadcrumbs, and let it sit until the broiler for a couple of minutes. Oh, and, yes, that's dried macaroni, not fresh. Ok, so I thought I'd give this a go. I've got a molecular gastronomy kit that I'd been given as a present last year which I thought had the right stuff to use here. I say thought as now I've tried it I'm not sure if something might be wrong! The carageenan isn't labelled as iota, just vaguely says "carageenans". Also, dumb question time, is citric acid the same as sodium citrate? I hope so because that's what I used. For the cheese I tried a combination of cheddar and pecorino. The mixture is currently cooling but it's really grainy and tastes pretty salty, any ideas which of the various things I might have messed up is likely to be the key here? As I understand it, sodium citrate is the salt form of citric acid so they are quite similar but not the same; however, citric acid is suppose to also work as a melting agent for cheeses. I'm not sure if citric acid is as effective as sodium citrate at a given weight so that might explain your results so far. I haven't played around with carageenans enough to know whether that is a factor. I've successfully melted straight cheddar into liquid (beer)using only sodium citrate. The citric acid is probably the source of your grainyness. I don't know if a higher quantity would help. I believe carrageenans control emulsification / gelling, and the different types (iota or kappa) set differently. I would speculate that kappa sets more firmly than iota based on its use in cheese slices and higher utilization in more firmly set gels. Your generic carrageenans are probably not causing grainyness. Someone up thread used kappa carrageenan for mac & cheese and reported success. The saltiness probably comes from the pecorino.It is usually much saltier than cheddar and gouda. 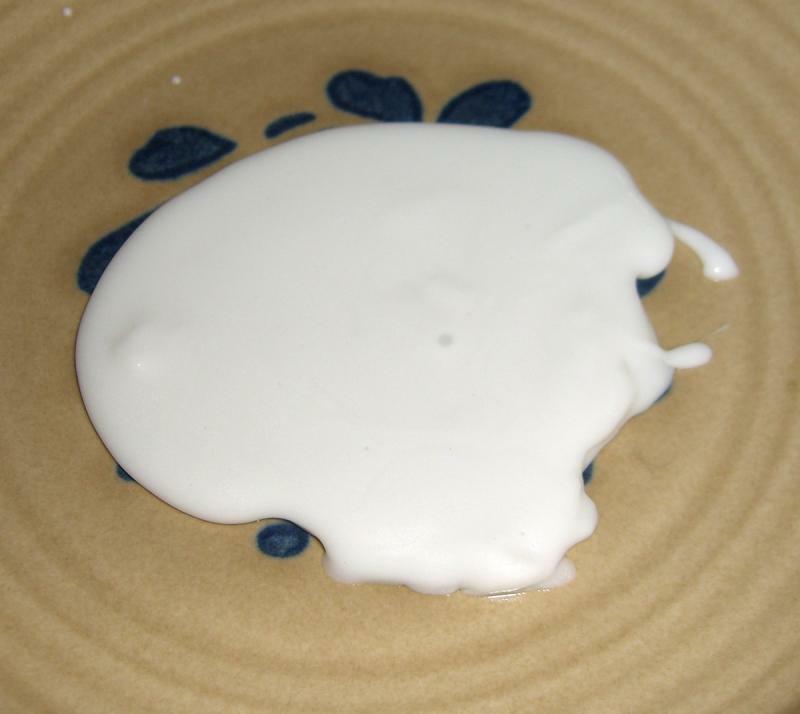 Dry pecorino is also a "non-melting" cheese. I tried the mango sorbet and it was only a partial success. It was really hard to get the jars to 'fluff' when I pulled the vacuum. I tried putting them in the chamber with the lids and outside the chamber with a jar attachment. Out of about 10 jars I only got one to fully raise to the top well, with 2 others that did it about part way. The others I just couldn't get at all. I'm not sure if it's a temperature thing or what. It's very strange. When the jars come out the lids are definitely stuck on, and opening them I can hear the rush of air, showing that it is pulling a vacuum. It's just not fluffing up like it should. On the bright side the one that did work properly was quite delicious. I just have to figure out why that one worked and do the same thing with the rest of 'em. Maybe it's just more difficult because of my altitude here? (Colorado). I am making this today - I am in Calgary, elevation 1000 metres so 600 metres lower than Denver - see it that makes any difference. b) plan to serve it straight out of the jars at table. I think Vitamin C tablets are ascorbic acid - which is very different from citric acid... Works great as an anti-oxidant to keep purees from browning, but I don't think it'll work as an emulsifier... plus, mangos have tons of vit. c built in, right? OK - so I'm almost finished with the prep for the party tonight... whew! I can't report too much on the results yet, as most of it is still in bags in the refrigerator... waiting... I did try a piece of the chorizo french toast, which was awesome. Also, I made the Flourless Gnocchi - haven't tried it yet but I can comment on the procedure. Blooming the gelatin in teh recommended amount of cream is challenging - there's so much gelatin compared to the cream (1:2 ratio, roughly) that I felt I needed to add a bit more cream to get it to fully hydrate. It then says to melt and let cool... I let it cool on the countertop - not in the refrigerator - and when it got to room temp, it was a solid block. So I put the bowl over a really low burner to warm slightly - just enough to melt the gelatin again and added to the riced potato. The potato/gelatin/TG "dough" is quite wet - I didn't even try to mold it into shape by itself. Instead, I rolled it into a snake in a piece of plastic wrap - maki style, and then let it cure in the refrigerator that way, rather than precut as the book instructs... tonight, I'll cut the snake into pieces and fry. Larry is correct -- citric acid isn't the same thing as sodium citrate; ask table salt if it would be just fine without that sodium atom! And yes, kappa carrageenan sets more firmly. MC notes that when using low-moisture (defined as less than 41%) non-melting cheeses, you should limit them to no more than 30% of the cheese by weight, and add 10% more liquid. Has anyone tried making Pommes Pont-Neuf on 3-323? 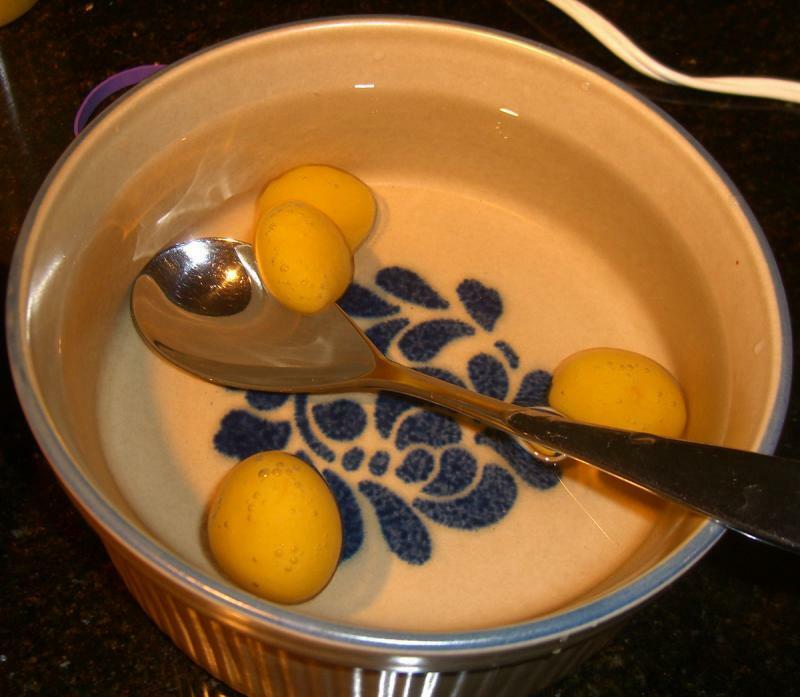 I find the scalings as is do not have enough water to even cover the potatoes. I made the Russet potatoes scaling at 67% instead of 100% and that seemed much butter. Second issue is that it says to boil them for 20 minutes and it notes that they should be nearly falling apart. After 12 minutes my potatoes are completely falling apart and almost impossible to remove from the pot in whole pieces with many of them breaking apart into nothing... I chucked my first batch and am now going to try boiling for about 9 or 10 minutes. Hopefully this post will demonstrate the value of Modernist Cuisine’s approach of example recipes along with best bets parametric recipes. 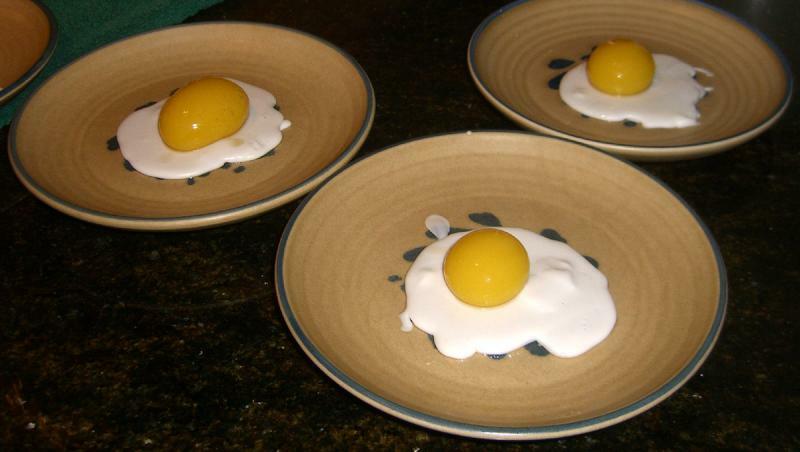 I liked the idea of a trompe l'oeil dish and the Sunny-side Up “Eggs” recipe looked like it fit the bill perfectly. The only problem was, I didn’t have several of the ingredients and supplies necessary to pull it off. The whites in the recipe called for gums I didn’t have, but looking in the best bets table for cold gels it looked like I could use kappa and iota carrageenan to make a cold gel for the whites. 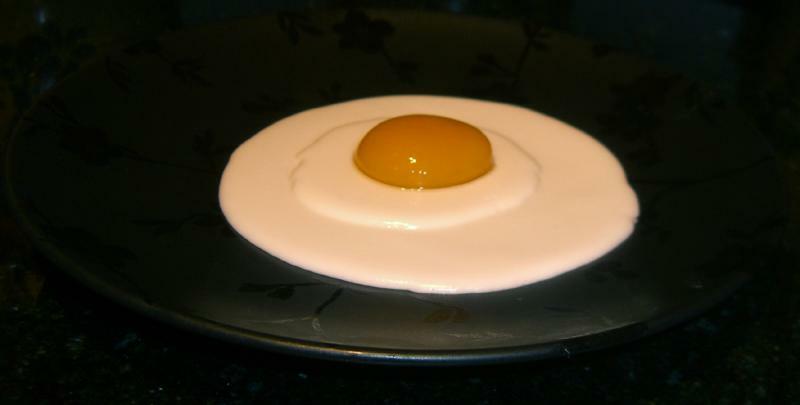 I was also missing the molds necessary to freeze the yolk mixture in, but what the heck, yolks are round, why not try reverse spherification? And as long as I’m playing I might as well make the yolks out of mango. Worst case I waste a can of coconut milk, a couple mangos and some time. Heck, I have a blender. I can always make a faux egg smoothie. Since I wanted to do this for a group my wife was hosting I decided to do a trial run, which is why the pictures below are from 2 different sessions. This was my first stab at the whites. I let the mixture cool a little too long and it was setting as I dished it out. I did pour on to cold plates. If I had known better at the time, or really cared, since this was just a trial, I could have re-heated the mix and had a smooth pour. 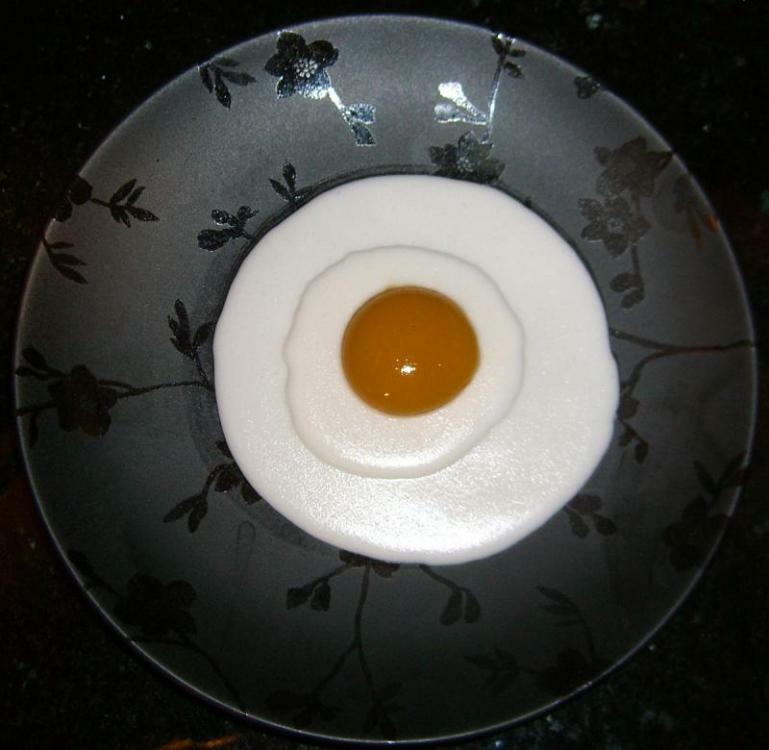 The yolks were standard reverse spherification technique. 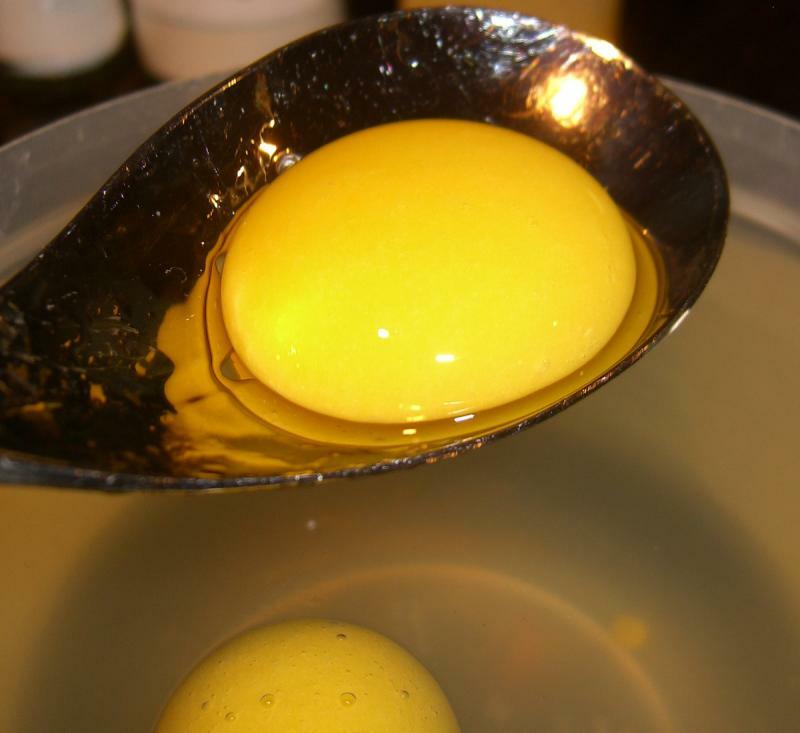 I tried a 10 percent sugar solution for the setting bath and the yolks floated which didn’t hurt anything. My second try (not pictured) I didn’t use sugar and the yolks sank. That worked fine also. 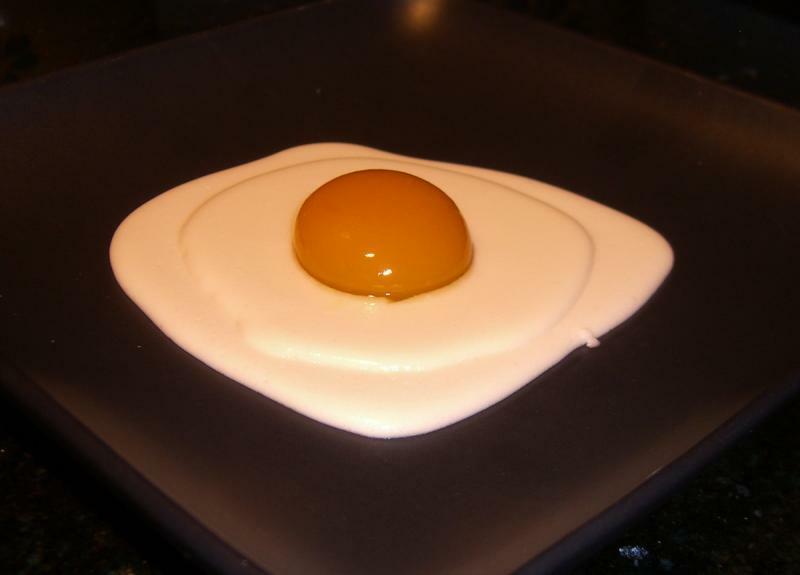 The first time I put the eggs together I placed the yolks on top of the whites. They did have a tendency to slide off. For my second try I poured the whites while they were warmer, onto cold plates. I also did a 2 pass pour. 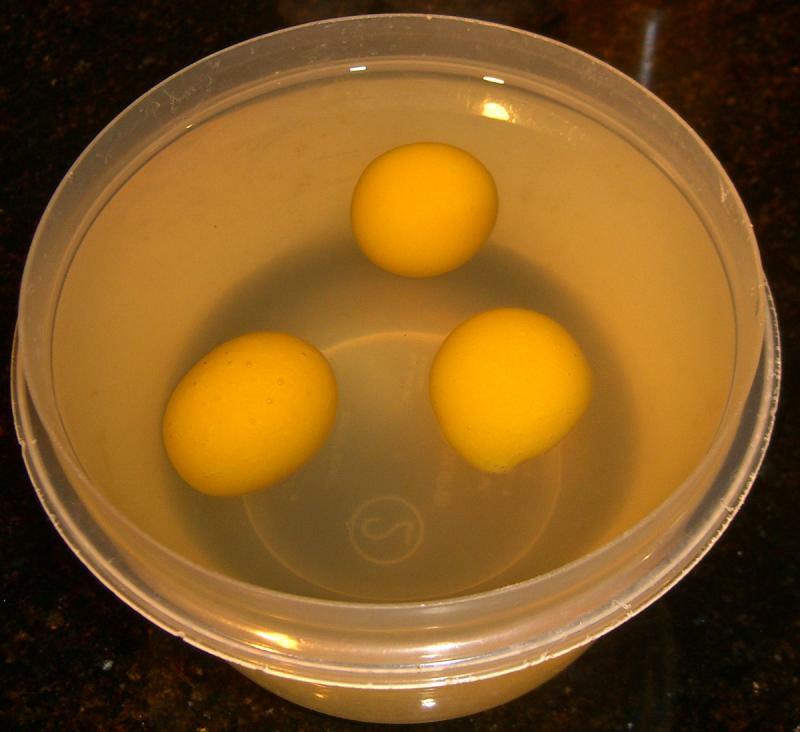 I also found a cutter about the size of the yolks to remove some white so they’d sit down and stay put better. All in all, a fun project that was wery well received. I haven't but that was next on my list. Yeah I noticed that when I did the math when scaling and then checked the change list and saw it. The magic number for me was taking the potatoes out after 6 minutes in the boiling water (not 20 as the book advises) since this is when they got to the point that they were nearly falling apart and these ended up being easily the best french fries I've made. Exactly as they say, very crispy on the outside even when left out for 10-15 minutes and nice and fluffy on the inside. To recap, the changes I made were 1) setting the potato scaling to 67% to ensure that the water covered them completely and 2) boil them for 6 minutes instead of 20. Like I mentioned before, even after 12 minutes on the first batch the potatoes were turning to mush and proved very difficult to remove from the pot. The Pommes Pont-Neuf recipe is in essence Heston Blumenthal's triple cooked chips. When I make those, I use water to cover and a heavy simmer rather than a rolling boil, which is likely to produce too much agitation and break up the chips. I then take them out when they look appropriately cooked, and cool/dry them in my refrigerator as I do not have a chamber vacuum sealer. These work very well. Well, my aerated mango sorbet worked out about the same as the previous poster - one of them did exactly what the book said, filled up the jar to the top, stayed that way and was still aerated and frozen 5 hours later. Of the other 5 jars would expand and then deflate when the vacuum released, even though the lids were sealed. Or they would expand and only patially deflate. Or they wouldn't expand at all. I was not entirely scientific in the 'experiment' and will try it again soon. I assumed the citric acid was to make the sorbet more tart (as in using lemon juice) to counteract the sweetness of the mango/simple syrup rather than performing a more technical role. The ascorbic acid did add a bit of that tartness. Frustrating that the results were inconsistent. Perhaps my chamber vac doesn't pull enough vacuum or I did something else wrong. Onward & upward. I made the Bacon chips last night. They were pretty easy. You mix up a syrup using maple syrup, water, sorbitol, isomalt and Glucose Syrup DE 40. I couldn't find any of that (well I could, but didn't need 5kg of it) so I went with light corn syrup. After that you let the bacon sit in the syrup for 2 hours then dehydrate it at 140 for 12 hours. Can anyone explain the particular rationale for the sorbitol, isomalt, and glucose syrup in the bacon chip recipe (the 5-220 version, not the apple butterscotch version)? MC doesn't explain in that particular recipe. I am guessing that the sugar alcohols are being used as humectants and not for their sweetener properties since there is syrup in the recipe already. Has anyone made them with just syrup and compared them to the MC version? Ideas would be appreciated. Anyone calculate the "sweet spot" of their broiler, per pages 2-22 and 2-23? I just did, and there's a few issues. First off, the rods in my electric oven are not evenly spaced; the element consists of 3 U-shaped rods, making 6 straight rods, and the middle one is slightly bigger than the 2 on each side, so my rods range from about 4.5 cm from each other to about 6.5 cm. That gives me a "sweet spot" that ranges from about 2.5 cm - 3.25 cm from the rods. That's an inch to an inch and a quarter for us metric-challenged people. That's a LOT closer to the element than I've been broiling at. I'm not even sure if I'm steady-handed enough to get something like a pizza in the oven if I've only got an inch to do it in. And it's confounded by the fact that the element is set in a metal support that hangs down about a quarter inch below the elements. The quoted formula is where you will get the greatest degree of evenness, however it is intense enough that this does not mean you necessarily need to cook there. If it is awkward, then cook farther away. Also, if your rods are not evenly spaced there is not much that you can do to make it perfectly even anyway, so cook where you think it will work best. Putting aluminum foil mirrors at the sides of the area where you broil will help evenness. My calculations were done with a full 3D model using (1/r)^2 fall off. Your results should be valid near the center of very large grill - i.e. where the rods are very long. In my case I did the calculation at the centerline, but took into account the finite size of the broiler directly. I also modeled dirtier reflectors (85% reflectivity not 100%). Yes, the distance between the rods and the reflectors matters, but not very much. 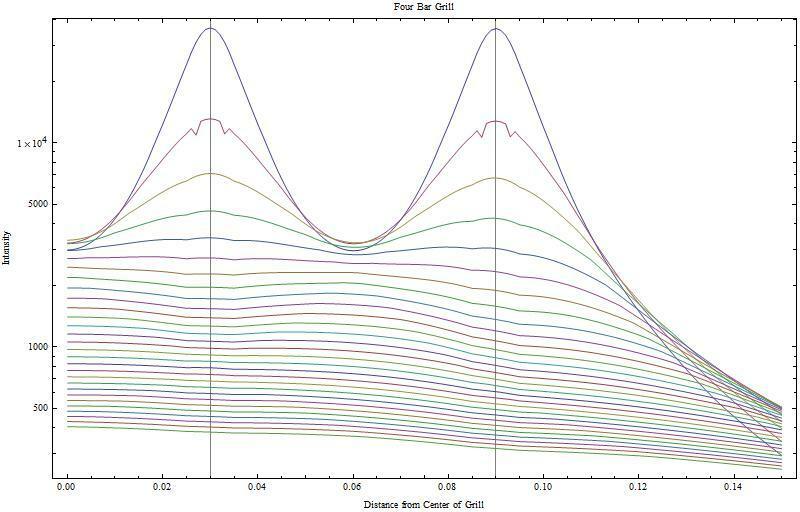 The way I derived the rule is that I did the calculations for literally thousands of different grill configurations and then plotted them up. To my suprise there was a pretty simple correlation which is the rule that we discuss in the text. Note that this depends on rod diameter as well, but most broilers are fairly similar. Sometimes they use a coil of fairly fine wire instead of a thick rod, but those are quite similar. Please note that this is just a rule of thumb. Real examples have lots of unique differences - one post above mentions unevenly spaced rods. My own Sodir broiler has a shiny back plate on one side and open on the other three - that changes things there. Putting up your own aluminum foil coller around a dish improves eveness by reflection - that makes a bigger difference than being at the exact sweet spot with respect to rod shading. Rod shading is one effect, but the fall off near the edge is in general a much bigger effect - that is why the aluminum collar is a good idea. The sweet spot will by necessity be at a place where the broiler is VERY intense. It's at the point where the reflected light from the top is just about as bright as the light from the rod itself, which puts it very near the rods. So even though this is where things are the most even, you may not be comfortable cooking at that intensity level. As another post mentions, your broiler may make it awkward to actually broil that close, or to see what you are doing. Visual inspection is important with a broiler, so cooking in a matter where you can't see what you are doing may be more even, but nonetheless is harder to do. I think that the main point here is to alert people to the fact that broilers are not very even in their heat. The fall off at the sides is substantial (unless you have shiny walls, or the aluminum foil coller). Also, it is counterintuitive, but the rods actually do shade the food, giving rise to the funny peaks you found. Here is a graph of absolute intensity for a 4 bar grill (like my Sodir). Only half of the grill is shown, because it is symmetric around the center. Distance from center is in meters - I probably should have normalized it also, but didn't. Each line shows the cooking intensity at a different distance from the rods. If we care about even heating rather than the absolute amount of heat, then we can compare them by normalizing to the center intensity. That gives us this graph. You can see the bumps, the shading and the edge effects. If you want no more than 10% difference from center to edge then look at the bands between 1.0 and .9 intensity. The "most even" cooking distance is shown here as the purple line that stays very close to 1.0 intensity, but eventually falls off and hits the 0.9 intensity curve much further to the right than then dense pack of lines below it. It is within 10% of center intensity almost to the point below the outermost rod. The dense pack of lines is only within 10% of being even to just past the center between the two rods - and they are 20% down from the center at the same point where the most even cooking distance is only down by 10%. Most people broil in the region shown by the dense pack of lines. It is not as even from center to edge, but the intensity is lower, and other practical considerations like being able to watch the food, are more important than the actual radiative intensity. For the life of me I cannot find the recipe for mushroom stock, which is referenced several times in the book. Help? You may have to go with the "vegetable" stock in Best Bet for Stocks on page 6 of KM or mushroom broth on page 19. Ranhofer recommends mushroom essence frequently in _The Epicurean_-basically mushrooms boiled briefly in stock and allowed to steep until cool.